We are family owned and operated locksmith in Reigate. All First for Locks locksmiths are mobile and based near you. Because of this you can be sure that we will respond very quickly, and that costs will be kept to a minimum. When you call First for Locks you will speak to a local locksmith covering the Reigate area – NOT a call centre hundreds of miles away! First For Locks are proud members of CheckaTrade – please click through to view our testimonials. 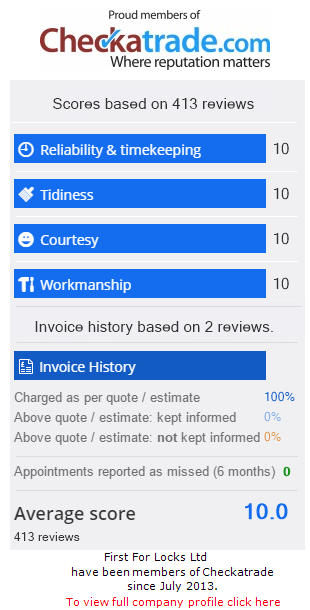 We would be delighted if you could review our business and inform other customers of your experience. We specialise in all types of locksmith work from garage door locks to uPVC windows and doors. In addition you will NOT pay a call-out charge, and if you are located in any of the following areas we can be with you within the hour.